Christmas soon outgrew the Christological controversy that created it and came to dominate the medieval calendar. 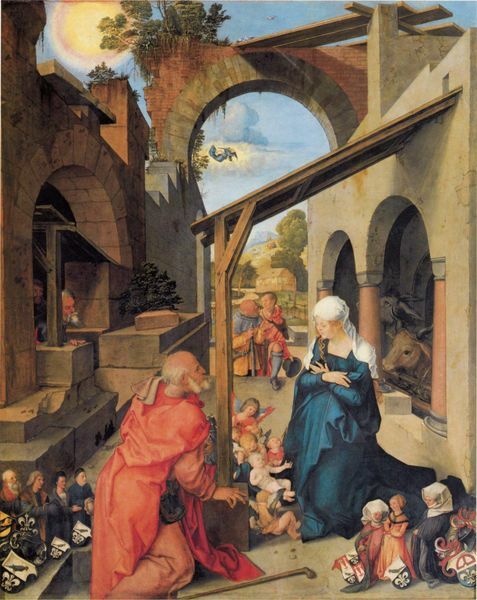 The forty days before Christmas became the "forty days of St. Martin," now Advent. The fortieth day after Christmas was Candlemas. The Egyptian Christmas celebration on January 6 was adopted as Epiphany, one of the most prominent holidays of the year during Early Middle Ages. Christmas Day itself was a relatively minor holiday, although its prominence gradually increased after Charlemagne was crowned on Christmas Day, 800. Although the nativity narrative is among the most compelling stories in the Bible, other Christian holidays such as Easter are more significant from a strictly religious point of view. The popularity of Christmas can be better understood if it is viewed as a form of winter celebration. Agricultural societies typically hold their most important festival in winter since there is less need of farm work at this time. The Romans had a winter celebration known as Saturnalia. This festival was originally held on December 17 and honored Saturn, a god of agriculture. It recalled the "golden age" when Saturn ruled. In imperial times, Saturnalia was extended to seven days (December 17-23). Combined with festivals both before and after, the result was an extended winter holiday season. Business was postponed and even slaves feasted. There was drinking, gambling and singing naked. It was the "best of days," according to the poet Catullus. With the coming of Christianity, Italy's Saturnalian traditions were attached to Advent (the forty days before Christmas). Around the 12th century, these traditions transferred again to the "twelve days of Christmas" (i.e. Christmas to Epiphany). Northern Europe was the last part to Christianize, and its pagan celebrations had a major influence on Christmas. Scandinavians still call Christmas Jul (Yule), originally the name of a twelve-day pre-Christian winter festival. Logs were lit to honor Thor, the god of thunder, hence the "Yule log." In Germany, the equivalent holiday is called Mitwinternacht (mid-winter night). There are also twelve Rauhn�chte (harsh or wild nights). By the High Middle Ages, Christmas had become so prominent that chroniclers routinely note where various magnates "celebrated Christmas." King Richard II of England hosted a Christmas feast in 1377 at which twenty-eight oxen and three hundred sheep were eaten. The "Yule boar" was a common feature of medieval Christmas feasts. Aside from feasting, there was also caroling. This was originally a group of dancers who sang. There was a lead singer and a ring of dancers that provided the chorus. Various writers of the time condemn caroling as lewd, the dancing may have got out of hand now and then (harking back to the traditions of Saturnalia and Yule). "Misrule" � drunkenness, promiscuity, gambling � was an important aspect of the festival. In England, gifts were exchanged on New Year's Day, and there was special Christmas ale. 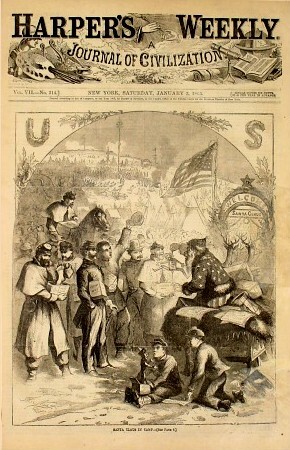 Santa Claus hands out gifts to Union soldiers during the US Civil War in Thomas Nast's first Santa Claus cartoon, Harper's Weekly, 1863. During the Reformation, Protestants condemned Christmas celebration as "trappings of popery" and the "rags of the Beast". The Catholic Church responded by promoting the festival in a more religiously oriented form. When a Puritan parliament triumphed over the King Charles I of England (1644), Christmas was officially banned (1647). Pro-Christmas rioting broke out in several cities. For several weeks, Canterbury was controlled by the rioters, who decorated doorways with holly and shouted royalist slogans. The Restoration (1660) ended the ban, but Christmas celebration was still disapproved of by the Anglican clergy (and, therefore, more thoroughly enjoyed by Catholics and Dissenters). By the 1820s, sectarian tension had eased and British writers began to worry that Christmas was dying out. They imagined Tudor Christmas as a time of heartfelt celebration, and efforts were made to revive the holiday. The book A Christmas Carol (1843) by Charles Dickens played a major role in reinventing Christmas as a holiday emphasizing family, goodwill, and compassion (as opposed to communal celebration and hedonistic excess). The phrase "Christmas tree" is first recorded in 1835 and represents the importation of a tradition from Germany, where such trees became popular in the late 18th century. Queen Victoria and her German-born husband Prince Albert enthusiastically promoted Christmas trees, as well as the idea of placing gifts under them. The royal family's tree of 1848 was widely publicized and imitated. Christmas cards were first designed in 1843 and became popular in the 1860s. The commercial calendar, created to answer children's questions concerning when Christmas would come, dates from 1851.